BHS Reels are designed to store cable, wire, rope, hose, or tubing without tangling and are available in a variety of compartment configurations and widths. Reels are ideal for use with Reel Stands, which hold up to five independently spinning reels, or these items can be ordered together as one unit—the Parallel Reel Payout (PRP) or the Parallel Reel Payout Wagon (PRW). 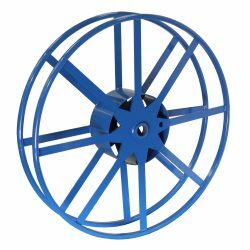 Reels are constructed from heavy-duty steel with a powder-coat finish to give them added reliability and durability. All compartments have predrilled arbor holes to accommodate a wide variety of wire gauges (0.75 inches to 1.12 inches). Hub plates feature through-holes to allow locking multiple compartments together. Reels are available in 20 different widths with one to five compartments. With custom sizes available, you can fine tune a reel stand to fit your needs perfectly. Download the informational PDF above for a list of available reel configurations. Rely on BHS Reels for a dependable and even payout. Call 1.800.BHS.9500 to learn more about our Electrical Equipment or to find a local dealer.